You know those afternoon OU games can be super hot. So what is a dedicated OU fan to do, especially if she is pregnant. Have someone make her an OU maternity dress and that would be me!!! This is my client’s design. I just made it for her and I think it turned out great. The client wanted straps, but couldn’t decide which fabric to use so I made them reversible. 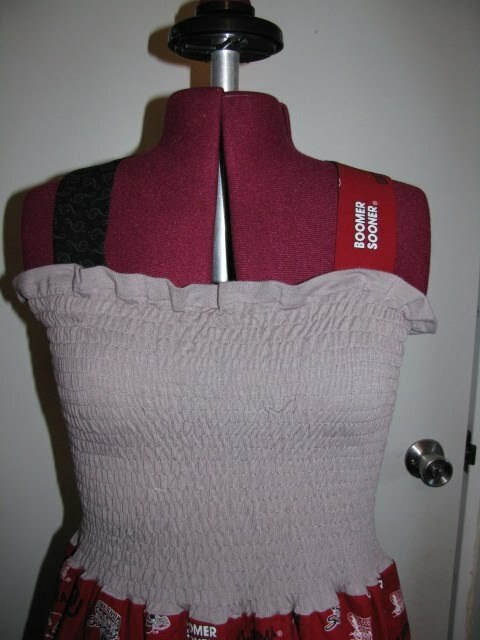 Also, I made the straps detachable in case she wanted to wear a white tank top or t-shirt under the dress. I think she will be comfortable in this dress at the games. With our crazy weather she could even wear it at a game in November or December. This dress is so adorable! I've been on the search (prowling google) for an OU dress to no avail. Everything is either really cheap looking or really short. Oh, my goodness! THAT is cute. I didn't have anything that cute when I was pregnant. Very cute! You are very talented! I love it over here….I'm like a kid in a candy shop. She just stood over my shoulder and swooned.